2.1 What Is A Reverse Osmosis Filtering System? 2.3 How Do Reverse Osmosis Filters Work? 3.2 Permeate Pump. Do You Really Need It? 3.2.1 Remineralization Filters. Do They Really Help? 3.2.2 What Is An Air Gap Faucet? Is It Any Good? 3.2.3 What is this faucet, and more importantly, is it worth the additional expense? 3.2.4 What Is The Difference Between A Single Pass And A Double Pass RO System? 3.2.5 What’s The Difference Between A One-Stage and A Two-stage System? Reverse osmosis systems offer one of the best ways of producing clean water for your household. Unlike other water filtering solutions, these systems are very efficient, being capable of removing up to 95 – 99% of the contaminants floating in your water. In the following article, we take a closer look at the top rated 10 RO systems you can buy in 2019, and we reveal their pros and cons. 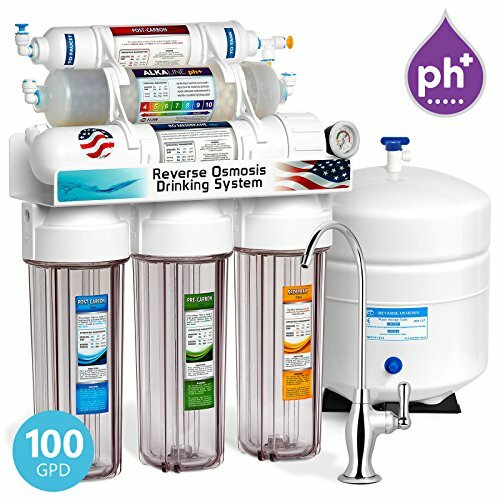 Are you new to reverse osmosis water filters? You came to the right place. 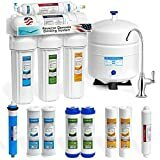 Our comprehensive buying guide and reviews will provide all the information you need to make an informed decision about the best reverse osmosis system for your household. We explain how an RO system works, and what each specific term means, so you can understand all the product descriptions you read. Reverse osmosis filters have an easy installation and a low maintenance, and it shouldn’t take you more than a few minutes once every few months to make sure everything is working as it should. Read our short installation guide to find out how to install the unit quickly and without leaks. 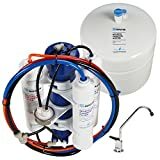 The Home Master ULTRA-ERP is one of the best reverse osmosis water filtering systems you can buy in 2019. With an efficiency ratio of 1:1, a permeate pump, and a UV light, there is not much this unit is not good at. One of the major advantages of using this filtering system is the permeate pump. This feature allows the system to increase the water flow while decreasing the wastewater production. The Home Master ULTRA-ERP is capable of producing up to 75 gallons of pure water per day, which is more than enough for your household needs. Another great thing about this model is the presence of the UV filter. This filter is capable of killing viruses, bacteria, and other microorganisms that might be present in your water source. The UV light has an automatic on/off switch, so it will turn on when it detects the water flow, and it will turn off some seconds after the water flow is turned off, making sure the water in the system is filtered. If you want to find out more about the Home Master TM ULTRA-ERP, you can read the whole review by clicking here. The Brondell H2O+ Circle is a small and compact reverse osmosis system that’s easy to install and very efficient. This model has an efficiency ratio of 2:1 and it’s capable of producing up to 50 gallons of pure water per day. One of the advantages of using this filtering system is that it’s very compact. Not only does this make it look better, but it will save up a lot of space, and make filter changes easier as well. Another advantage is that this reverse osmosis system comes with a stylish faucet. The faucet has a chrome finish, and a built-in LED light will notify you when the filters need changing. If you don’t like the faucet’s chrome finish, don’t worry. You can connect the filtering system to other faucets, as well. Just make sure you contact the customer support to check if your faucet model is compatible with it before you make a purchase. Although this is a good and efficient reverse osmosis system, one of the disadvantages of using it is that the filters are harder to find than those produced by the competition. You can only find the filters on the manufacturer’s official website, and shipping taxes may apply, depending on where you live. 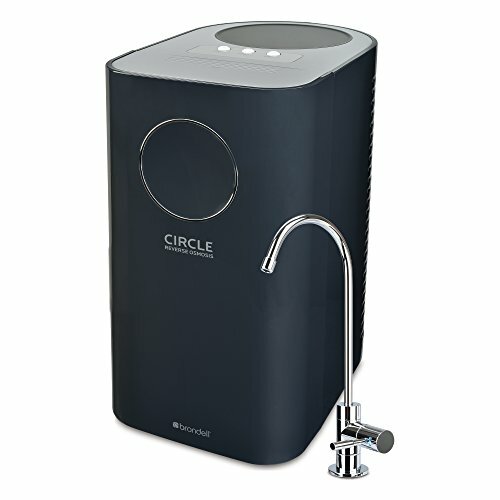 To find out more about the Brondell H2O+ Circle reverse osmosis system, click here. 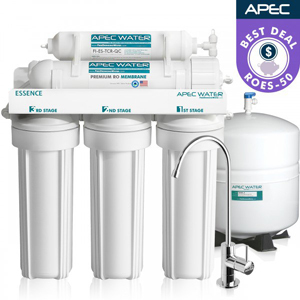 The APEC Top Tier 6 Step is one of the most advanced water filtering solutions you can buy at a decent price. With a 3:1 wastewater pure water ratio, this is an efficient way of filtering your drinking and cooking water. 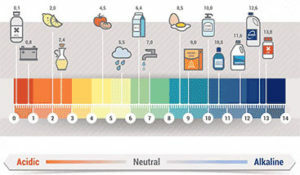 This model uses a 6-step filtration process. While most of the water purifying sequence is similar for every reverse osmosis unit, this one has an additional filter which will add minerals to your drinking water. The added minerals will make the water healthier and better tasting at the same time. One of the advantages of using this model is the longevity of the water filters. While the first three filters have to be changed every six months, the reverse osmosis membrane and the carbon filter have to be changed only once every 2-3 years, depending on your water source. The water neutralizer filter has to be changed once every 4-6 years. Another advantage is the ease of installation. This RO system comes with a detailed instruction manual, and you will be able to follow it without any problems for a step-by-step guide. If you like following video tutorials more than you like following written instructions, that is also a possibility. There are a lot of helpful videos on Youtube you can watch. To learn more about the APEC Top Tier 6 Step, click here. 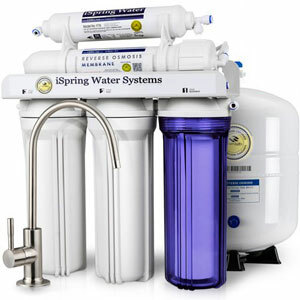 The iSpring RCC7AK-UV is high-quality reverse osmosis system, complete with mineralization and UV filters, capable of filtering even the foulest of waters. This is a highly efficient filtering system, having an efficiency ratio of 2:1. One of the advantages of using this RO system is the UV filter. This filter is capable of killing the microorganisms, viruses, and bacteria in your water source, providing a high-quality drinking water. The UV light turns on automatically when it detects the water flow, and it turns off a couple of seconds after the water flow is turned off, making sure that the water already in the system is filtered. Another advantage is the use of a carbonate and a red mineral filter. These filters will add minerals to the filtered water, making it healthier and better tasting. A slight disadvantage of buying this model is the poorly written instruction manual. Thankfully, there are video tutorials online which will help with the installation. Otherwise, a lot of people might have had problems trying to install this unit. Click here to find out more about the iSpring RCC7AK-UV. The APEC Top Tier 5 Step is one of the budget choices we included on our list. This reverse osmosis system uses a basic 5-step water filtration process. This model has a water filtration efficiency of 3:1, so it’s above average compared with other models. Despite its lower price, this is a good filtration system, and it will remove most contaminants in your water source. One of the advantages of buying this unit is its accessible price. Not only does the APEC Top Tier 5 Step have a decent buying price, but all the filters are also rather cheap. As you would expect, the reverse osmosis membrane is more expensive, but that’s normal since it is the most important component in the filtering system. Another advantage is the clean and detailed instructions manual. Nobody will have any problems following the instructions during the installation. The images are clear, the indications have short and concise, and every detail is specified, so you won’t miss anything. This model also comes with a spare set of filters, so once you buy it you’ll be able to use it for at least a year without having to spend additional money. To learn more about the APEC Top Tier 5 Stage, click here. 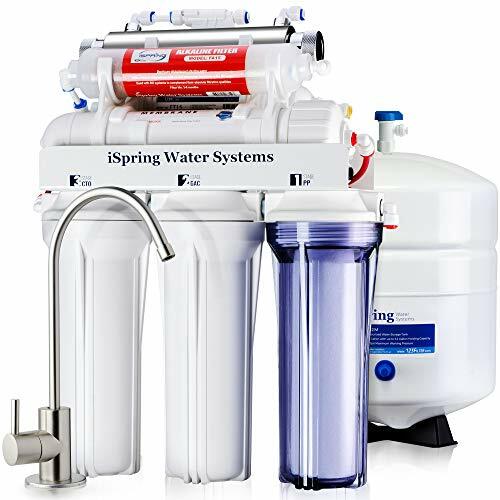 Another budget choice, the iSpring RCC7 is a high-quality reverse osmosis system, and it filters the water through 5 different filters. Even though this is one of the cheaper models we included in our list, the quality of the water it produces is still top notch, so the system proves to have a good value. One of the advantages of using this system is its efficiency. Most reverse osmosis water filtering systems are considered efficient if they have a wastewater pure water ratio smaller or equal to 4:1. With an efficiency ratio of 2.5:1, this model is actually highly efficient. The installation instructions are a small setback if you choose this unit. The written instructions are poor, and most people find them difficult to follow. Luckily, there are video tutorials online that can guide you through the installation. If at any given time you’re stuck and you don’t know what to do next, you can also contact their customer support for advice. iSpring’s customer support experts really know what they’re talking about and they will provide helpful advice and instructions. To find out more about the iSpring RCC7 – 5 stage, click here. The Express Water ROALK10DCG surely has one of the boldest marketing claims. The manufacturer advertises this model using a 10-step filtration process. While this information is not necessarily untrue, it’s surely deceptive. While most manufacturers consider the remineralization filter as a sixth step, Express Water considers that each step of the mineralization is a separate step of the whole filtration process. So, instead of having a 6-step filtration, this model is advertised as having a 10-step one. 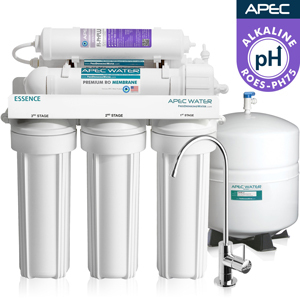 With a wastewater pure water efficiency of 2:1, this is one of the most efficient reverse osmosis systems you’ll find on the market in 2019. Not only is the Express Water ROALK10DCG efficient, but it also has a nice filter system. These filters will remove up to 99% of the contaminants in your water source, and they will also remineralize the water, improving its taste and making it healthier. Installing this system is easy, and most people will be able to do it themselves in under two hours. The most difficult part of the installation is to find the right place for every filter since there are a lot of them. However, finding the right spot is easy because the filters are color-coded, so you will be able to install them in no time whatsoever. Click here if you want to learn more about the Express Water ROALK10DCG. This is the single portable reverse osmosis water filtering system we included on our list. The Countertop Portable Universal 5-Stage is small enough to fit on your kitchen countertop, but you can also hand it from a kitchen cabinet so it won’t take up any space. The major advantage of using the Countertop Portable Universal is its portability. Not only does this mean you can take it with you when you leave on vacation, but it also means you won’t have to waste time installing it. The installation process will literally take up to two minutes, and you won’t need any tools for it. You might need an adjustable wrench, but only if your faucet’s aerator is too tightly screwed to be removed by hand. The system is compatible with over 90% of the most popular faucets currently available on the market, so you shouldn’t have any problems with its installation. Another advantage of this RO system is its efficiency. The Countertop Portable Universal will produce 2.6 gallons of wastewater of every gallon of pure water it produces. This means that this model is very efficient, despite its small size. A slight disadvantage is that this model doesn’t come with a tank. This means you will have to manually turn the unit on and off when you want, and use a water recipient of your own to collect the water. This is not a major con, but you won’t have any filtered water if you forget to fill a recipient. To learn more about the Countertop Portable Universal 5-Stage, click here. 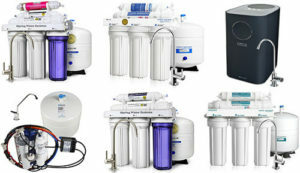 The Express Water RO5DX is a good reverse osmosis water filtering system that can be bought for an acceptable amount. 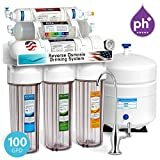 Even though this is a cheap RO system, it’s still very good and efficient, and it fully deserves its place on this list. With a wastewater pure water ratio of 3:1, this is an efficient unit that will produce pure water and save you money in the long run. Using an efficient filter is also better for the environment, as less water is wasted. One of the advantages of using this unit is the high-quality filters. Even though this model only uses a 5-step filtration process, the filters are capable of removing up to 99.99% of the contaminants in your water source. The filters are also easy to change, and you won’t need other tools than the filter wrench provided by the manufacturer for this operation. Another advantage is that this RO system is easy to install, and you can do it quickly. The filters are pre-assembled, so that will save you some time. The instructions manual is easy to follow, and all the instructions are detailed and concise. If you want to find out more about the Express Water RO5DX, click here. The last but not least on our list, the Home Master Standard is a popular reverse osmosis water filtering system. With a water efficiency ratio of 4:1, this model fits right into the efficient systems category. 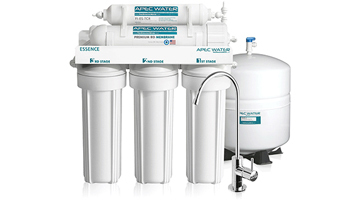 The Home Master Standard uses a classical 5-step filtration system. However, the filters and the reverse osmosis membrane are highly efficient at blocking the contaminants in your water, so up to 99% of them will be removed in this process. The main advantage of using this RO system is the modular filter design. This design allows you to change the filter housing at the same time with the filter, so there are fewer chances for bacteria to grow in the housing, or for leaks to appear. Not only does this make the filters more durable and efficient, but it also increases the system’s durability as a whole. The filters are also very easy to change, and you only have to change them once a year. Installing this unit is a piece of cake. The instructions manual is clear and detailed, and the purification unit comes fully assembled, so you won’t waste any time on it. All the cables are color coded, so making the right connections is easy and straightforward. Click here to find out more about the Home Master Standard. There are several things you should be aware of when you’re looking to buy a reverse osmosis water filtering system. Most household owners heard of this kind of system, but they don’t really know what it is and how it works. 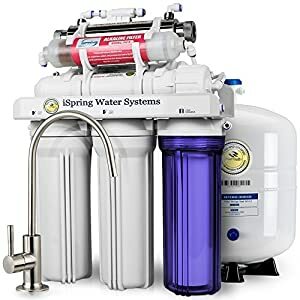 In the following section, we will explain the most common terms you’ll encounter when looking for a reverse osmosis water filtering system, and how this type of system works. 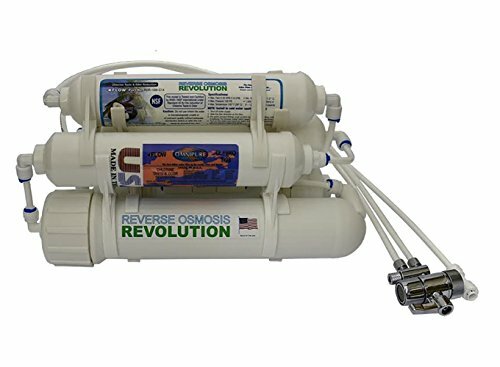 Reverse Osmosis, most commonly known as an RO system, is a water purification technology that passes the water through a semipermeable membrane to remove the polluting particles. Unlike other water filtering systems, RO is able to remove smaller particles, either dissolved or suspended floating in the water, so the filtered water’s quality will be better. RO systems are able to remove particles as small as ions, molecules, and even some species of bacteria from the water, and they are used in the industrial production of potable water. Reverse osmosis is also one of the processes that are able to remove salt from saltwater, for recycling, wastewater treatment, and it can even be used to produce energy. 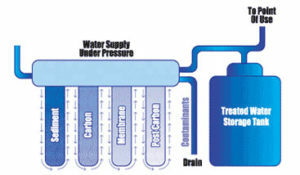 To understand how a reverse osmosis filtering system works, you first have to understand the main principles of osmosis. Osmosis is a naturally occurring process where a weaker saline solution tends to migrate towards a stronger one. If for example, you have two containers connected through a pipe but separated by a semi-permeable membrane, one containing a saline solution, the other fresh water, the fresh water will tend to flow towards the saline container. This happens because solutions have a natural tendency of seeking the higher concentration. Reverse osmosis follows the same process, only in reverse. Instead of having a solution with a lower concentration shifting towards a more concentrated one, an external force is applied to the concentrated solution, making it move towards the lesser concentrated one. The semi-permeable membrane will only allow molecules of a certain size pass through it, so the majority of salts, microorganisms, bacteria, and other debris will be blocked. 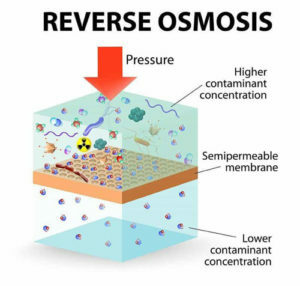 Reverse osmosis filters work by applying an external pressure on the water, forcing it to pass through the semipermeable reverse osmosis membrane. When the water passes through this membrane, 95 – 99% of its components are blocked and diverted into the reject stream. The amount of pressure needed for this operation depends on the quality of the water source. If a water source is more contaminated, the pressure required to push it through the RO membrane will be higher. The resulting filtered water is desalinated and demineralized. 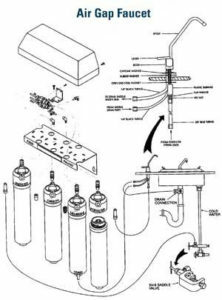 It is technically called permeate ( or product) water, but you’ll more often find it called filtered or pure water in instructions manuals and product descriptions. The water stream carrying the contaminants is technically called the reject (or concentrate) water, but you will more often find it called wastewater. This stream doesn’t pass through the semipermeable membrane. When the water stream enters the RO membrane, the water molecules are allowed to pass, but the dissolved salts and other contaminants are blocked. Instead of accumulating near the membrane, these contaminants are discharged using another stream of water. This wastewater stream and its destination differs depending on the RO system used. Most of the times, the wastewater is directed straight to the drain, but other times it can be sent back to the main water supply, or it can even be recycled through the system in order to save water. Most RO systems can divert this water so you can use it to water your plants or wash your pavement. The filtered water has a superior quality, and it usually contains only 1 – 5% of the contaminants it did before the filtration. Reverse osmosis filters use the cross filtration process instead of a standard filtration. In a standard filtration, the contaminants are collected and absorbed by the filters. This makes the filters less efficient over time, as the level of contaminants contained grows. With cross filtration, however, the filtered water goes one way, while the contaminated one goes another. Water is used to sweep away the contaminants, and the same water keeps the reverse osmosis’s membrane surface clean. Reverse osmosis systems usually have 5 filtration steps or more, some of them claiming to have as many as 10 individual steps. No matter how many steps an RO system has, the first 5 are usually the same. They will often have different names but do the same thing. Here is a brief description of the main filtration steps. Step – This is the sediment removal stage. Usually, the first filter is used to block larger contaminants, like clay, rust, stones, and silt from the water. Most manufacturers use a 5-micron filter for this step. Any particle larger than this will be suspended, ensuring no harming elements will reach the membrane. Step – This is usually the first carbon filter step. This filter is used to remove most of the harmful chemicals in the water, including chlorine. These chemicals can be harmful and they can change the water’s taste, so they have to be removed. Step – The second carbon filter. This is where most of the remaining particles in the water are suspended. Unlike the first carbon filter, this one is denser and more compact. This allows it to block more particles from the water, the resulting stream being almost clean. Step – This is the most important step in the filtration process. This is where the water has to pass through the reverse osmosis membrane. The RO membrane is a semi-permeable membrane capable of removing even the smallest particles. Usually, the contaminants are removed according to their weight, size, and ionic charge. Elements larger than 0.0001 microns are removed from the water, and so are those with a molecular weight above 200, or a high ionic charge. This is where all the heavy metals present in the water source are removed, and also the radioactive components. At this point, all the suspended contaminants are drained out the RO system, and the pure water is separated. Step – This can be the last step for many reverse osmosis systems, but others can follow as well. This is a very important step of the filtration process, even if it’s the last one. During this step, chlorine, bacteria, viruses, and bad smells or odors are removed from the water. If this is the last filtration step, the filtered pure water goes directly to your faucet or in the water tank, depending on the system. Step – This is an additional step in the filtration process, and it has a major role in producing a better tasting water. After the water passes through the reverse osmosis membrane, most of its contaminants are removed. Unfortunately, so are the minerals in the water. Most people rely on their drinking water as a source of minerals, and drinking a lot of mineral-free water can be more harming than good for your body. In this step, however, minerals are added to the filtered water. This will make the water healthier, but it will also make it better tasting, as the added minerals will increase the water’s pH. The resulting water will have a similar taste to that of bottled water. Step – This is an additional step used by only some of the manufacturers. Even though this step is rarer, it is also very good. This is the UV filter, and it has a major role in reducing the number of bacteria, viruses, and microorganisms in your water. The UV filter is usually a UV light bulb, so the RO systems that use one will also need a power source, like an electrical outlet. The UV light will kill most of the animated contaminants present in the filtered water, making it healthier and better suited for human use, especially for children or elderly. Any Steps Above The Seventh – Some manufacturers have divided the remineralization process into more steps, thus increasing the overall filtering steps of their RO systems. While their products may be advertised as 10-step systems, the added steps are only part of the mineralization process and do nothing more. Reverse osmosis filters are actually some of the most advanced water filtering systems you can buy for your home. 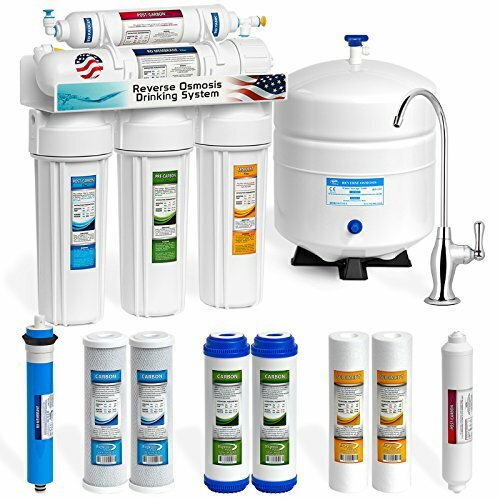 An RO system is capable of removing up to 99.99% of the contaminants in your water, depending on the quality of your water source. The RO membrane blocks the contaminants based on their size and ionic charge. Usually, a contaminant with a molecular weight higher than 200 is blocked. Similarly, any particles larger than 0.0001 microns will also be blocked. At the same time, particles with a higher ionic charge will also be stopped by the RO membrane. For example, calcium has two ionic charges and it’s easier blocked than sodium, which only has one ionic charge. For this same reason, CO2 particles are usually not blocked as they go through the RO membrane. CO2 particles are not highly charged, and they are relatively small in size, so the RO membrane has a tougher time removing them. Due to their high water filtering efficiency, reverse osmosis filters are very efficient at treating ground or surface water. You can even use them to treat brackish water. Reverse osmosis filters are used in food and beverage industries, in the pharmaceutical industry, and by the semiconductor manufacturing industry. TDS means total dissolved solids. When it comes to drinking water, TDS usually means all the inorganic components in the water, such as calcium, sodium, potassium, chlorides, sulfates, and bicarbonates, along with some of the organic matter dissolved in the water. TDS can be measured in a lab, or by measuring its electrical conductivity. Measuring the TDS level in a lab is more accurate and reliable than measuring its conductivity, but it’s also more expensive. Measuring the electrical conductivity is inexpensive, and the results are within 10% of the ones you get in a lab. A high-quality RO water filtering system is capable of reducing up to 90% of the TDS in your water, but this amount varies depending on your water source. If you’re looking for a reverse osmosis water filtering system, you most likely already noticed that all the models come with an efficiency ratio. Reverse osmosis systems are considered efficient if their wastewater pure water ratio is smaller or equal to 4:1, but how is this ratio calculated? One of the problems with this efficiency ratio is that the standard calculating procedure is not very realistic. Every reverse osmosis system is tested at ideal conditions when the water’s temperature is at 77 degrees F, and the water pressure is 60 PSI. Unfortunately, these conditions are rarely encountered in real life, so your system’s efficiency will vary. This will most often mean that the RO system you buy won’t perform as well as you would expect, as it will frequently have a considerably less output than the one presented on the sheet. It’s complicated to calculate the exact output of the system, as low water temperatures and low water pressure considerably reduce the output, but so does a high TDS level. If your water source has a high TDS level, the amount of water necessary to displace the contaminants will be higher. Permeate Pump. Do You Really Need It? Most people believe that the permeate pump is an equivalent to the electric pump, but it’s not. The permeate pump enhances the reverse osmosis system’s performance without producing any additional pressure for the unit. Instead, the permeate pump reduces the back pressure produced by the system’s water storage tank. This allows the RO unit to use all the pressure it has. The permeate pump works by storing the wastewater’s hydropower and using this energy to power the pure water under pressure into the system’s water tank. RO water tanks use air pressure to push the filtered water out of the faucet. RO systems without a permeate pump use some of their pressure to force the water into the tank, so their efficiency will decrease. Units with permeate pumps will use the pressure created by the wastewater to push the pure water into the tank. The result is a remarkable increase in power and efficiency. Another advantage of using an RO system with a permeate pump is that it will also be more economical and environmentally friendly. Since the system can fill the water tank without so much back pressure, less water is rejected and the filtered water is purer. Remineralization Filters. Do They Really Help? One of the first things you’ll notice when you talk about RO systems is that people say the filtered water has an unusual taste. The change in taste is due to the water being filtered through the RO membrane. When water pushes through the membrane, it will lose most of its components, and its pH value will be lowered. This will make the water more acidic, changing its taste. If you tasted the filtered water and you believe it has an unusual taste, you should look for an RO system with a remineralization filter. This filter will add minerals to the water, increasing its pH. The resulting filtered water will taste as bottled mineral water. What Is An Air Gap Faucet? Is It Any Good? 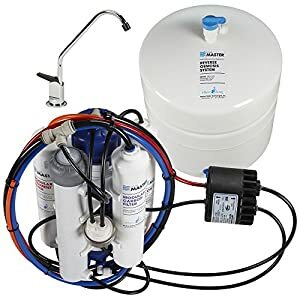 If you’re looking for a reverse osmosis water filter, chances are, you noticed some of them come with an air gap faucet, while most of the models that don’t have it as a standard offer it as an option. What is this faucet, and more importantly, is it worth the additional expense? Air gap faucets provide a siphon break for reverse osmosis systems installed under the sink. This means that in the eventuality of a block in your sink, the dirty water won’t be siphoned into your RO system. Depending on where you live, the local legislation might require that all the RO systems have an air gap faucet. The main disadvantage of having an air gap faucet is the difficult installation. They usually need a different sized hole for the installation, and they also need three pipe connections instead of one. Some customers also claim that the air gap faucets are really noisy, thus lowering the overall rating of the RO system. What Is The Difference Between A Single Pass And A Double Pass RO System? A single pass reverse osmosis system follows the filtration process once. The double pass RO systems use the pure water produced by the first pass like the first one uses the water feed. This way, the water is filtered twice before reaching your faucet. The water filtered by a double pass RO system has a higher quality than the one produced by the single pass system because it is actually filtered twice. Another difference between the two types of water filters is that the second pass system removes more carbon dioxide particles by injecting a caustic between the passes. The caustic increases the water’s pH and transforms the carbon dioxide into carbonate and bicarbonate, making it easier to block. Adding a caustic before the first pass is impossible because it would make the calcium particles attach to the RO membrane. What’s The Difference Between A One-Stage and A Two-stage System? When you use a one stage reverse osmosis system, the water that enters the system goes out as partially pure water and partially wastewater. In a two-stage system, the pure water from the first filter is collected, and the wastewater becomes the feed water for the second pass. The resulting pure water is then combined with the first one collected, and that’s the water collected in the water tank. Most of the RO systems we reviewed are easily installed. In fact, one of them doesn’t need an installation, it just needs to connect to your faucet and it’s ready to work. The Countertop Portable Universal 5-Stage is a portable unit, and you can connect and disconnect it to the faucet by simply twisting the aerator off and twisting the RO system on. The rest of the filter systems we reviewed have to be installed permanently, and even though they’re made by different manufacturers, the installation process is pretty much the same all around. Most people will be able to install the RO systems on their own, without relying on professional help. However, keep in mind that these systems are designed to be installed in a kitchen cabinet under the sink. If you plan on installing them farther away from the sink, in a basement or a storage area, you should buy all the necessary additional parts beforehand. For most people, the toughest part of the standard installation is drilling a new mounting hole for the pure water faucet. Keep in mind that you have to check with your local authorities before installing a faucet, as some might demand you install an air gap faucet instead of a standard one. You should also note that some kitchen sinks come with an additional faucet hole that might be blanked off. If this is the case, you don’t need to drill a new hole for the faucet, you only have to remove the existing cover. Install The T-Connector – All the RO systems come with a T connector and a push fit connector. In some cases, the push-fit connector might already be attached. Connect The Waste Pipe – You have to drill a hole in the waste pipe if you want to install the waste connector. The best place to make the hole is in the horizontal section of the waste pipe, as it will reduce the noise produced by the water flushed down when the system is working. Mount The Filter – For most of the models we reviewed, you will have to mount the filter to the side of the cupboard. Keep in mind that you will have to periodically change the filters, so you should mount the filters in such a way that you will have plenty of free space for this operation. Install The Water Tank – Install the water tank on the cupboard’s base. Make sure you install it on a flat and level surface. Connect The Water Pipes – While this process might seem complicated, it’s actually very simple thanks to the color-coded connectors. This is a great way to make sure all the connections are in their right place. Plug The System In An Electrical Outlet – This step will only be necessary for the RO systems that have a UV filter. Make sure the electrical outlet is placed close enough to the RO system, so the power cord will reach it. Turn The Water Back On – Turn the water on and look closely for any leaks. If there are some leaks, turn the water off and try to remedy the failure using Teflon tape. However, keep in mind that you shouldn’t use Teflon tape if you install the Countertop Portable Universal because that will surely lead to leaks. Fill And Empty The Water Tank – This is an important step in the installation process, as it will activate the filters. Check the instruction manual provided by the manufacturer to find out how many water tanks you have to fill and empty before drinking the filtered water. Do not drink the water before this step is completed. Once the system is installed and running well, there are not many things you have to do except changing the filters. Depending on the RO system and your water source, the interval for the changes will be shorter or longer. On average, most systems we reviewed use filters that have to be changed once every 6 months. There are some that have more durable filters, like the Home Master ULTRA-ERP, and you should only change their filters once every year. As a rule of thumb, the filters before the reverse osmosis membrane, also known as the pre-membrane filters have to be changed once every 6 – 12 months. The RO membrane has to be changed every 2 – 3 years, even though some models use membranes that can last even 4 years without changing. The filters that come after the RO membrane are also more durable, and you will have to change them only once a year, or even once every 2 years. Some models come with transparent filter cases, so you will be able to see when it’s time to change the filters, while others come with LED lights notifications, so you will always know when to change them. All the systems we reviewed have easy to change filters, even if they are slightly different. In most cases, you won’t need any additional tools for the filter change, while for others you will need the filter wrench provided by the manufacturer. No matter which RO system you choose, changing the filters will only take a few minutes every 6 months or so, the rest of the time being spent without any maintenance necessary. Check out the ultimate water softener buying guide and the facts and myths behind the water softener shower heads! Reverse osmosis water filtering systems offer one of the most advanced ways of producing clean water for your household. Recent technological advancements lead to an increase in efficiency and quality, so new RO systems produce a water of similar quality to bottled water. RO systems are easy to install and to use, and they are capable of removing 95 – 99% of the contaminants floating in your water. Despite their higher initial cost, these are durable units, most of them able to produce high-quality water for 10 – 15 years or more. We hope you find something that fits your needs in the best reverse osmosis system reviews!